Contrary to popular belief, St. Peter’s Basilica in Vatican City is not the Pope’s official church nor the head of all churches in the Roman Catholic faith. In fact, it’s not even a cathedral. Although St. Peter’s Basilica may be the largest Roman Catholic church (with an area of 5.7 acres) and a lot of papal ceremonies take place there, the ‘Archbasilica of St. John Lateran’ or the ‘Basilica di San Giovanni in Laterano’ is the official seat of the Bishop of Rome, who is also the Pope. Titled ‘Mother Church’ the Archbasilica of St. John Lateran is the oldest and number one ranking Church of the Roman Catholics. 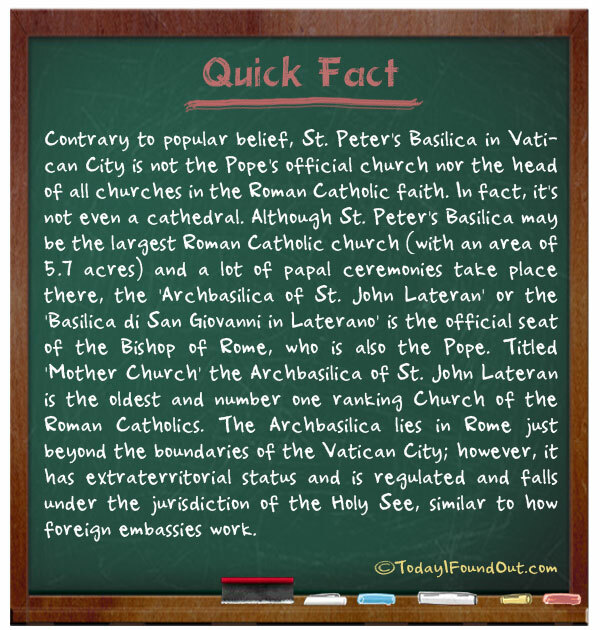 The Archbasilica lies in Rome just beyond the boundaries of the Vatican City; however, it has extraterritorial status and is regulated and falls under the jurisdiction of the Holy See, similar to how foreign embassies work.